From a young age, Liz was drawn to young children and families and has chosen to surround herself with and work with them. She discovered Rudolf Steiner and Waldorf Education when she was working on a Biodynamic and Organic Farm as an intern. As she continued to work on organic farms all over the country, she continued to study Anthroposophy. 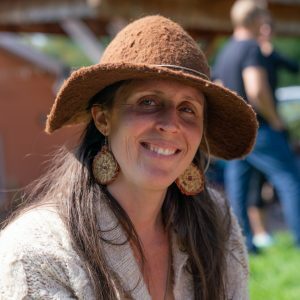 Eventually, she earned her Lifeways Early Childhood Certification and is in the middle of completing her 3 year Waldorf Teacher Training with Sound Circle. This is in addition to already holding a degree in Psychology from Bryn Mawr College with a focus in dance/movement and education. She furthered her studies by earning her Early Childhood Education Certification with the State of Colorado. While following more closely what she felt that children were asking for, she was led to studying the Art of Mentoring/Coyote Mentoring and the 8 shields Model and she currently leads nature awareness summer camps. In continuing to follow the stream of what is alive for her, she became a student of Martin Prechtel, studying indigenous culture. She has tutored and nannied using Waldorf curriculum for the last 10 years in the Boulder area as well as home-schooled her 2 boys, age 4 and 9. She has been an assistant in the little Lavenders classroom for the past 2 years. This is her first year as a Lead Teacher and feels honored and fully ready to step into this position. She is deeply grateful for the many teachers and mentors in her life. When she is not teaching, you can find her working in her large market garden or going for a long wander in nature. Her other great passions are animals, dance, singing, reading, making beautiful things, primitive skills, wild-crafting, all things related to the wilds of pregnancy/birth/early childhood, all soul centered ways of being, her children and her community.